Comfort Concentrate is ideal for laundry use in both commercial and domestic premises. This is a household known brand and this product is added to washing machines to help clothes to look and feel fresh and clean. It is ideal for use in both commercial and domestic premises. Comfort Concentrate is available to buy online and includes a bulk buy option. Ace Laundry Bleach - 1 Litre. Ace Laundry Bleach is ideal for use in laundrettes, hotels, B&B and other commercial and domestic premises where regular laundry needs to be done. This product is under the Procter and Gamble brand. It effectively removes stains, as well as brightening colours and keeping white coloured items brilliant white. It is a gentle formula and is safe to use on a wide range of materials including wool and silk. It is available to buy online and includes a bulk buy option. Laundry sacks with a water soluble strip. Coloured red.Prevents cross-infection. 100 hot water soluble red laundry sacks. 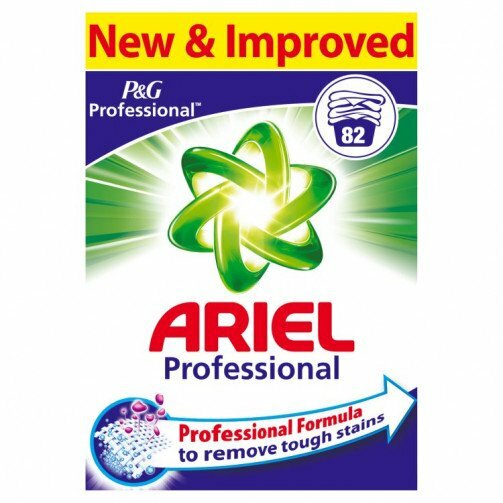 Ariel Biological is perfect for your everyday washing needs. Its unique formula has been designed to give you brilliant cleaning and stain removal results. Your clothes will keep looking new and fresh for longer and your whites will stay whiter. With its great cleaning and stain removal properties, Ariel Biological is designed to help keep your clothes looking like new, with your whites staying white, wash after wash, all year round. With this Ariel Biological washing powder being used at a 30 degree wash saving electricity and also your carbon footprint. Being a 110 wash box this industrial size washing powder can be used in domestic areas as well as launderettes and other environments including nursing homes, schools and hotels. Whites (from 30 to 95°C) Light colours (from 30 to 60°C) Mixed light colours (from 30 to 40°C).